Lineal Champion: Tyson Fury*Fury has been inactive since November 2015 and announced his retirement earlier this year. 1. 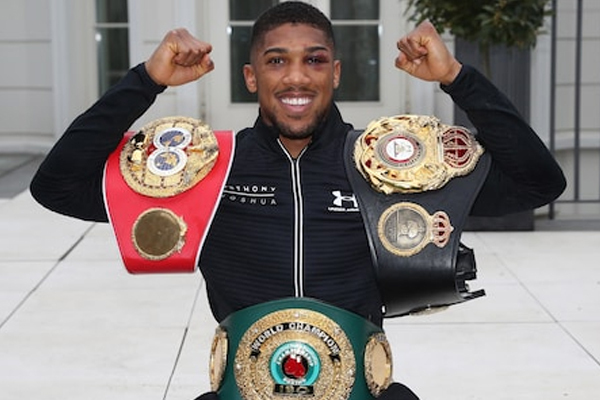 Anthony Joshua The IBF and WBA belt holder is 19-0 with 19 KOs. The most exciting big man to emerge in a generation. 2. Luis Ortiz The Cuban does not have any of the big four belts, but he knocked out Bryant Jennings and only Joshua’ KO of Wladimir Klitschko is a more impressive win. 27-0 with 23 KOs. 3. Deontay Wilder Wilder is 38-0 with 37 KOs, but Bermane Stiverne is the only top-10 heavyweight he has defeated. 4. Joseph Parker He has the WBO belt and is 24-0 with 18 KOs. He has good tools but was hardly dominant last weekend against Hughie Fury. 5. Alexander Povetkin 32-1 with 23 KOs, it is hard for me to understand why Povetkin doesn’t get more respect–his failure to pass PED tests in recent years might have something to do with it. But his resume is hard to argue with. 6. Kubrat Pulev 25-1 with 13 KOs, Pulev was knocked out by Wladimir Klitschko is his first title challenge. He is set to face Anthony Joshua later this year. The Bulgarian is big and strong with a solid jab–a good package for a heavyweight contender. 7. Andy Ruiz Jr. The rotund Ruiz is never going to win a beach body competition. But he gave Parker a very tough fight. 29-1 with 19 KOs, he has very solid boxing skills. 8. Carlos Takam Takam is a gate-keeper to be sure, but he is a dangerous fighter. Big and athletic, he is 35-3-1 with 27 KOs. 9. Dillian Whyte 21-1 with 16 KOs, he has already been knocked out by Joshua. But he has stuck around and remained a contender. He’s an important stepping stone, at the very least. 10. Jarrell Miller I view Miller as a long shot to become a true factor at the top of the division. But he is 19-0-1 with 17 KOs and has beaten some other fringe contenders. He has the personality to sell tickets. His weight has been trending upwards to 300 pounds in his last couple of fights, which is not a good sign.